FAHSI (Filipino American Human Services Inc.) will be hosting a forum on November 16 from 9:00 am to 5:00 pm at the Philippine Center to present the findings of the Community Needs Assessment and to discuss issues of concern to the community. The Community Needs Assessment is made possible by a grant from the Asian American Federation. FAHSI is a 501C3 nonprofit social service organization whose mission is to bridge the service gaps for low-income, disadvantaged Filipinos with culturally and linguistically appropriate services, engaging youth, women and seniors in identifying the needs of their respective groups and leading program initiatives that address those needs. 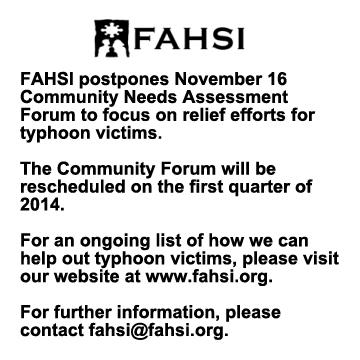 The Philippine Consulate General is co-sponsoring the November 16 Community Forum.